I was art director at The Philadelphia Inquirer Magazine from 1982 to 1986. A wonderful staff crammed in a very small space crammed between the Sports department and the typesetters' showers. Editor David Boldt and Managing Editor Carolyn White made a wonderful combination of serious reporting and taunting commentary (for example: "The Dumb Belt" by Jack Smith). Writers Mark Bowden, James McBride, and Richard Ben Cramer wrote for the magazine, and staff photographers Larry Price and Sarah Leen followed international stories. Tom Gralish won a Pulitzer for his 1985 work on the homeless. Photography by Nick Kelsh, left, and Larry Price. I partnered up with friend and photographer Nick Kelsh to create annual reports, corporate magazines, and private school collateral until 1992. I loved the variety of the work, including a book for ASMP, "10,000 Eyes," and an exhibit in the lobby of the United Nations, "Families of the World." From 1996 until going back to National Geographic in 2005, I edited, designed and packaged books. And did a lot of sailing. I was Creative Director of National Geographic magazine for 10 years, charged with the presentation, design, art, and graphics in National Geographic Society’s flagship publication and its tablet edition. I guided the evolution of the NGM Design/Art department from separate staffs of designers and art directors in 2005 into an integrated team of 34 designers, art directors, graphics editors, cartographers, researchers, and producers, including the digital editions team producing the tablet and iphone versions of the magazine. During my tenure at National Geographic, it was recognized with 23 National Magazine Awards, including four General Excellence awards, four Best Tablet Edition awards, three Photography awards, and Magazine of the Year in 2012. The magazine and individual projects were repeatedly recognized by the Society of Illustrators, Society of News Design, Malofiej, the Society of Publication Designers, and Pictures of the Year International. I have worked with Joel Sartore often over the years. One of the earliest stories we worked on together was for Dead or Alive: America's Endangered Species Act published in the March 1995 National Geographic. Powerful pictures in what was to become a lifetime project, The Photo Ark. One of the highlights in this story was the graphic representation of each endangered species on a double gatefold, grouped by stressor: loss of habitat. competition, disease. From this came the book The Company We Keep by Joel and writer Doug Chadwick. 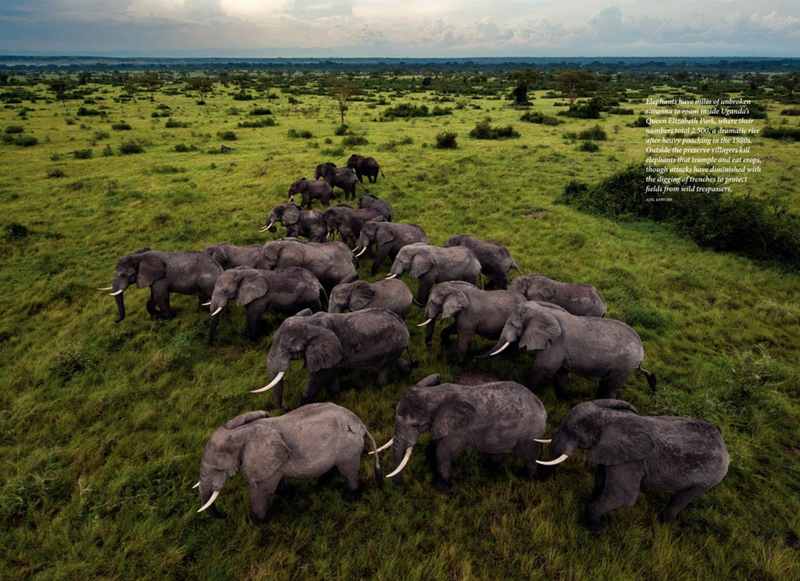 The opening run of photographs in RIFT IN PARADISE: Africa's Albertine Rift in National Geographic's November 2011 issue is a great example of the power of narrative photography. Using a series of images, building not only a storyline from one to the next, but also increasing emotional investment, becoming more powerful together than alone. You can't do this with all stories—a breadth of style and talking points are needed. It worked here. And in Robb Kendrick's story on Coal that appeared in NGS a few years ago. And the opening in Yellowstone, which follows. This is another example of the power of a series of images. 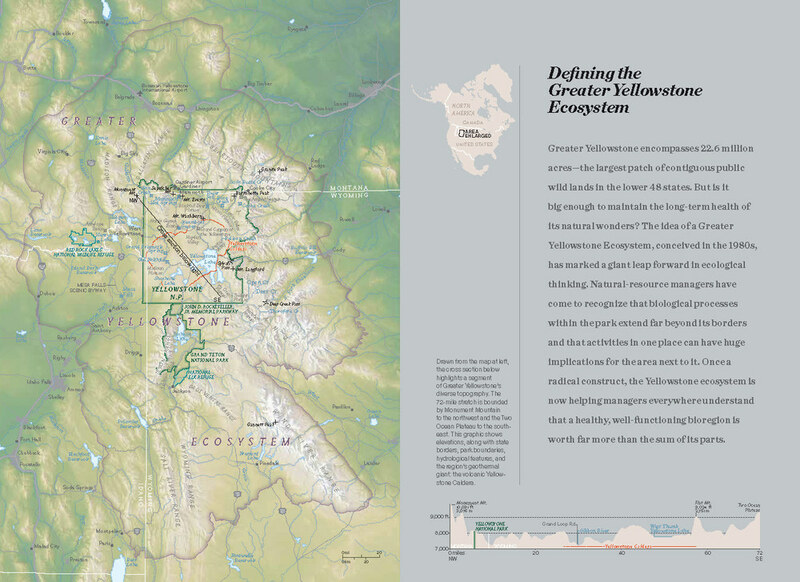 We move from the unique geologic features of the Yellowstone ecosystem, to wildlife and the idea of managing "wild," to living with the wild and coming into conflict with it—sometimes surviving and other times not. The writer, David Quammen, discusses "the paradox of the cultivated wild." Photography by Michael Nichols, David Guttenfelder, Charlie Hamilton James, Erica Larsen, Ronan Donovan and Joe Riis. Picture editing editing by Kathy Moran. I designed the issue. Rising sea levels will change the way we live. We can't mitigate our way around it. We have to adapt: protect populated areas or move entire cities. Fight or flight. We did a cover story on rising sea levels in 2013. Part of the concept for the illustrations was what the world would look like if all the Earth's ice melted—up to the Statue of Liberty's waist. Artist Nick Kaloterakis rendered the statue. Florida at ground zero. For the February 2015 issue I worked on a story on sea level rise impacts on Florida. We looked at the effects of only a five-foot rise which many scientists predict is possible before the end of the century. The mapping told the story with more impact than photography. I've become a bit obsessed about how to tell the sea level rise story. It's one that most people past 50 years old will never experience. It's a future story. But solutions and adaptations and dialog need to start now. I've started visiting both populated places and protected areas in a series of scouting trips, looking for the best stories about what will be lost or changed. Below is an area affected by salt water intrusion in the Dennis Creek Wildlife Management Area in New Jersey. See more from that project here.